Posted by elizabethwong in Democracy, Huh? !, Human Rights, International, Malaysia, Note2Self, Politics. There is a highly polluting aluminium smelter plant to be built in Bintulu, destroying virgin forests, displacing indigenious people and polluting the environment with harmful and toxic emissions. But hey, there’s billions to be made here, so nosy environmentalists have to be stopped. What can we do, Elizabeth? It seems we are helpless and at mercy of our governments. Bodies like suaram, can only express concern and condemn, but what after that? EW: Dear Environmentalist, we don’t just express concern, we campaign and help organise resistance to such monstrosities from here. There’s already an international campaign building up, but similarly the work in Sarawak must also move up a few notches! If criminal record is being encoded into MyKad then it is reasonable. But anti-logging activities??? How could they refuse him (Dr. Kua) entry based on this? WTF. This present government is rotten & getting worst day after day. That’s the reason why I refuse to use MyKad as Banking ATM or for any other purposes proposed by this sickening BN. U can scream and shout and call for explanations but the govt. just buat tak tahu! Such is the state of affairs of the country right now. Just dun know how this country can be saved! According to yesterday’s Guardian news Rio Tinto is raising money (£20 billion) to buy Alcan (no debt crisis for the fat cats then), and no doubt that purchase is connected to the plan to build a smelter in conjunction with the chief minister of your nearby jungle paradise (oops, I meant logging and mineral-extraction opportunity). I quote from the Herald Tribune of 7 August 2007. “Rio Tinto will hold a 60 percent stake in the venture to be known as Sarawak Aluminium Company. The remaining 40 percent will be owned by Cahya Mata, in which the family of Sarawak Chief Minister Abdul Taib Mahmud is a key shareholder”. OK, then how strange is it that Bakun Dam issues suddenly wash downstream? We can read between the lines just like card readers can read the code. The whole world is watching Big Brother. My father was born in TANAH MELAYU. I was born in MALAYSIA. Looks like walking away is not a bad option. Malaysia is sliding dangerously towards becoming a fascist police state under UMNO-BN. The police and enforcement agencies have been politicised and corrupted into becoming organs of the ruling party. The hijacking of the mass media, constant attempts to indoctrinate the population, incessant racial posturing, stonewalling over government scandals, hysterical persecution of dissenting voices and now the abuse of the MyKad system to keep tabs on civil society activists all bear a sinister resemblance to the rise of the Nazis and Fascists in the early 1930’s. “He also forced everyone, small and great, rich and poor, free and slave, to receive a mark on his right hand or on his forehead so that no one could buy or sell unless he had the mark, which is the name of the beast or the number of his name. This calls for wisdom. If anyone has insight, let him calculate the number of the beast, for it is man’s number. His number is 666” (Rev. 13:16-18). A prelude for more to come, nope? Whispering9, that Revelation quote is never far from my mind and memory 😉 The ultimate fascist trademark way to go. I think a few got the insight. 666 is very close to 6666. Maybe September 11 celebrations round the corner. What a shame…After 50 years….only in Malaysia…a free Malaysian is barred from entering certain part of his country. That’s the start of the so call hypocrisy in the formation a country….marriage of conveniences …but not a true marriage at all. Yes we all know that Sarawak and Sabah became Malaysia on the conditions that they have certain irrevocable powers…but that was 50 years ago. That should give whoever in power to have enough time to convince the people there to have no walls separating the Malaysians. This is clear…that divide and rule is always in these totally insincere politicians. When are the people going to wake up and change it? Wait, am I missing something here? How is it a crime to lobby against logging activities that could harm indigenous folk? Where’s the crime?! If there are checkpoints across state lines, will I be held for “speaking against the government”? Because it’s the same thing! This is ridiculous and beyond the pale!! Lets not start jumping up and down like monyets. Lets not be monkeys like some people we know… so, is Dr.Kua’s personal history entered into his Mycard database, or is his entry denial an instruction in the immigration database? 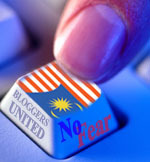 If the mycard is used as a “big brother” watching us, then right thinking Malaysians need to do something fast. Actually, by accessing your personal data inside MyKad, the Immigration Department can also access your whatever records with Polis and other linked department. The real data is not stored inside the MyKad itself. Get your fact right first.